The collision of two Chinese bullet trains on 23 July 2011 has elicited public outrage on its microblogging services. The crash caused by a lightning strike that stalled a train was not totally unexpected as China has been expanding its high speed rail network at breakneck speed. Still this is nothing compared to the disaster that will be visited upon China when another of its fast speeding contrivances, that is, its economy, starts to hit the skids. China has been copying and modifying imported rail technology in order to breach the speed limit. Its meddling with its trains is akin to its tinkering with its economy writ small. A picture tells a thousand words. The two charts from The Financial Times on the left demonstrate that China is dangerously breaking the economic speed limit. The most revealing information from these charts is that China's net exports, much ballyhooed as the driver of China's GDP is not what it was made out to be. Instead it's its gross fixed asset investment or gross fixed capital formation, i.e., before depreciation, that's the real engine of growth. 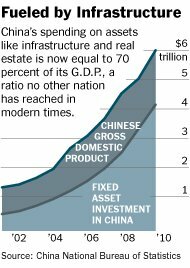 Compared to Japan's fixed asset investment in its bubble years, which topped out at 35 percent of GDP, China's figure is now approaching 50 percent of GDP. Even the US registers only 20 percent. China's investment, mostly debt financed, has gone past diminishing returns, swinging into negative territory. Its rail accident may be due to its failure to grasp the need for the rail signalling software to keep pace with advances in the hardware. Similarly, its breakneck economic growth would be incomplete without a corresponding growth in debt financing. Rushing headlong into capitalism just after ditching communism is hazardous for a nation that hasn't grasped the dark side of capitalism. The final chart from The New York Times is more alarming. The difference between this chart and the above is that the fixed asset investment includes expenditure on land and inventories which the gross fixed capital formation excludes. This chart shows that China's GDP closely tracks its fixed asset investment. The investment, at a staggering 70% of GDP, is unprecedented in economic history. One Chinese microblogger perfectly summed up the bleak situation that is dawning over China: "China today is a train travelling through a thunderstorm. None of us are spectators; we are all passengers." The two colliding high-speed trains with 1,400 passengers registered only 39 fatalities. Its economic train with 1.3 billion passengers however won't be so lucky.